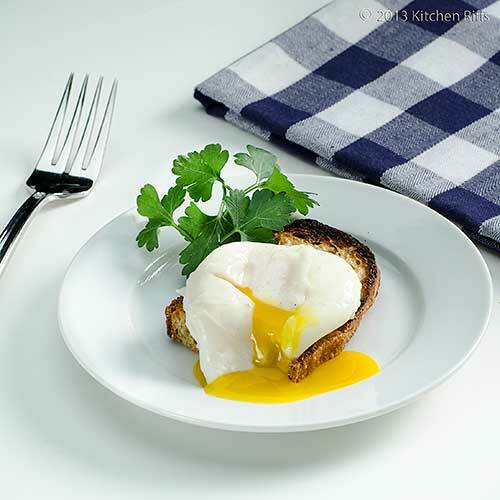 How often do you poach eggs? Rarely? Never? Join the club. Most people think poaching is difficult and fussy, so they never prepare eggs this way at home. Too bad, because poaching might be the one of the healthiest ways to cook eggs (no added fat). And poaching is even simpler than hard-boiling — no hot eggs to cool off and peel. How about flavor? Glad you asked! Because poaching may be the best way to showcase an egg’s natural tastiness. Poached eggs are great breakfast fare. They’re also wonderful as a garnish on salad (and a necessity for the classic Salade Frisée). And if poached eggs didn’t exist, we’d have to invent them just so we could make Eggs Benedict. By learning just a few simple steps, you can become a poach meister. Then the next time you’re preparing eggs for brunch, be sure to ask how people want them cooked. Some wiseacre (you know the one) will say he wants his poached. You can just smile and say, “Of course.” It’ll probably ruin his day. Poached eggs are simple (really!) to make: Bring some water to a simmer. Crack an egg and slip it into the water. Simmer for a few minutes. Voilà, poached egg. But, of course, there’s always a catch. With poached eggs, it’s this: Once you slide that egg into the water, the white can billow out into an unsightly, stringy mess, leaving the yolk almost naked. Eeek! You’ll virtually never have this problem if your egg is very fresh (the white will cling to the yolk naturally). But really fresh eggs can sometimes be hard to find. You can also achieve perfectly shaped poached eggs if you buy some of those forms that are made especially for egg poaching. The metal ones work well, and the silicone ones are excellent. Any kitchen supply store carries them. If looks are important to you, this is the safest way. But you should be able to achieve a perfectly presentable poached egg even without a form, as we explain in this recipe. This dish takes 4 minutes cooking time, plus several minutes to bring water to a simmer — say 10 minutes total, tops. You can prepare as many eggs as you like at a time, but I suggest trying no more than 4 at first (that number is pretty easy for most people to manage). You can also prepare poached eggs ahead of time and then rewarm right before serving — see Step 7 of the Procedure. Fill a skillet or saucepan with about 2 inches of water. It’s easiest if you use a low, wide cooking vessel (i.e., a skillet; if you have a nonstick one, use that). Add vinegar if using (this helps the egg white coagulate — the eggs won’t taste like vinegar). Bring water to the barest simmer. While the water is coming to a simmer, break each egg into an individual small container, such as a ramekin. When the water is just about at a simmer (with tiny bubbles just rising to the surface), begin poaching the eggs. Pick up the first ramekin, dip half of it in the water, and slide the egg into the water. If the white strings out, use a heatproof spoon or spatula to (carefully) push the white over the egg yolk for a couple of seconds or so. Repeat with the other eggs. Simmer for 4 minutes. Using a slotted spoon, remove the cooked eggs one at a time. If you want to serve the eggs right away, drain them briefly on a towel (at this point, the whites will be set and the yolk will still be a bit runny, but the eggs aren’t as delicate as you might think — you can handle them carefully without worrying about the yolk breaking). If there are any trailing pieces of egg white, you can cut trim them with kitchen scissors, if you wish. BTW, if you’re worried about any faint taste of vinegar clinging to the eggs, you can dunk each one in a bowl of warm water before draining it. Serve; or, if you want to prepare the eggs ahead of time, follow Step 7. If you want to prepare the eggs ahead, simmer for 4 minutes as in Step 5. Then use a slotted spoon to remove the eggs one at a time. Place the cooked eggs in a bowl of ice water to cool. If you’re planning to use them within the next hour or so, you can just leave them out on the kitchen counter. If it’s going to be longer than that, store the cooked eggs in the refrigerator (in the bowl uncovered — they’ll keep for 2 or 3 days). When ready to use, trim any trailing egg whites if you wish. Dunk the eggs in barely simmering water for a minute to warm them, then serve. As noted in Step 1 of the Procedure, it’s preferable to use a skillet or other wide cooking vessel — because a wider vessel makes it easier to get the eggs into and out of the water. Nonstick cookware is best for poaching because eggs occasionally stick. If they do, no big deal. If they’re a bit reluctant to come loose when using a slotted spoon, simply slide a spatula under them. This rarely happens, but in case it does, you know what to do. If you’re using metal or silicone forms for poaching eggs, follow the instructions that came with them. Typically, the metal ones go right into the cooking water (then you slide the eggs into the forms). The silicone ones usually float in the water (then you slide the eggs into them). Adding vinegar to the cooking water really does help the egg white hold together. If I think my eggs are on the older side, I use this method; otherwise I just skip it. With that said, though, you really do want to use eggs that are as fresh as possible — they’ll look much better no matter what poaching method you use. Try to find eggs that are no more than a day or two old if you want the best looking poached eggs. Some people like to “swirl” the cooking water with a spoon or a whisk, creating a vortex. When they add the egg, the vortex action is supposed to keep the egg white intact. I’ve tried this and it does seem promising — but no more so than the vinegar trick (my sample size is limited, however). Refrigerated eggs may be fully cooked in under 4 minutes — say 3½ (“cooked” being defined as an egg with the white set and the yolk still runny). But at 4 minutes you’ll still have plenty of runny yolk, and the egg will stand up to handling, so that’s the amount of time I always use. Eggs carry a slight (but real) risk of salmonella. So you may want to use pasteurized eggs if this concerns you. The issue is particularly important in the case of poached eggs since the yolks won’t be fully cooked, and may not reach the heat level necessary to kill salmonella. You can identify pasteurized eggs because they have usually a red “P” stamped on them. Some people like to add salt to the poaching water to help flavor the eggs. I usually just season them at table. Speaking of seasoning, most people like their poached eggs with salt and freshly ground black pepper. So serve your eggs with these seasonings, and whatever else you prefer. A poached egg on toast makes a great breakfast. 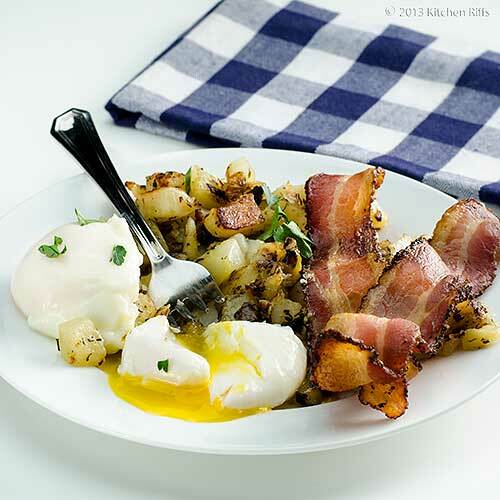 Poached eggs also pair well with other breakfast favorites —bacon, sausage, potatoes, or whatever sounds good to you. Mrs. Kitchen Riffs took a bite of poached egg and smiled. “Love the runny yolk!” she said. We were eating “breakfast” for dinner — something we like to do, as discussed last year in our post on Fried Eggs. “These really are good,” I agreed. “They’re actually easier to make than fried or scrambled eggs, though people think they’re more difficult. That’s Mrs K R — always thinking strategically. When I was a kid, I had two poached eggs and toast every morning for breakfast. My mom had an electric poacher that worked like a charm. I'm dying to try this, however. Perhaps a great lunch for a cold snowy day? Cheers and thank you for a great read. Hi Amy, I forgot all about those electric egg poachers! They were popular when I was younger, too, although I haven't seen them around lately (although I'm sure they're still there - I've probably overlooked them). Thanks for the comment. I have a poaching pan with the metal forms and mine work like a dream but for grins I've tried poaching them in water. I'm so used to the perfection of the forms I haven't loved the results. Thinking vinegar would help, I've tried it too but again, very hard to get as nicely done. Still...one of my favorite eggs; my girls love them too but always associate them with Hollandaise. Makes it a bit more work but always a special breakfast. Hi Barb, those metal forms really do work! And they're probably the way to go if you want perfection. I get a pretty good looking egg without the forms, but they're certainly not perfect (as you can see in the pictures). Thanks for the comment. I love poached eggs, they also fit in so many diets and healthy lifestyles ! Perfect day for poached eggs. Breakfast, lunch or dinner on this beautiful snowy day. Yours look perfect. Hi Sketched Chef, aren't poached eggs nice? And they really are healthy, as you say. Thanks for the comment. Hi Vicki, the snow we're having today is something! What happened to spring? Thanks for the kind words, and comment. An interesting read. I have metal holders but seldom use them though they definitely make for a nicely shaped egg. I actually had eggs benedict on a hash brown for lunch on Sunday - my son took me out for my birthday. It is one of my favourite dishes (with salmon not bacon). I will have to take more care from now on to get my poached eggs just right. Hi Uru, they were wonderful! ;-) Thanks for the comment. Hi Suzanne, those holders are nice if you want the perfect looking egg. I guess I'm not that picky, so I never use them - but they do work. Eggs Benedict with salmon is a nice twist - lovely combo of flavors. Happy Birthday! And thanks for the comment. Your poached eggs look wonderful. I actually just heard about this method. My daughter said that she had found this method on the internet and had tried it. She said that it worked great. Hi Dawn, poached eggs really are pretty easy. And incredibly tasty! Thanks for the comment. Hi Kristi, the nice thing about the ramekin method is you can plop the egg into the water gently, so the white is more apt to cling to the yolk. Definitely worth a try. Thanks for the comment. Hi Maureen, great mind think alike! ;-) That's such a great dish. Thanks for the comment. Eggs Benny are holiday tradition at our house - we the pan with the cups. It makes you feel good when your grown child says yes we will be over Christmas morning for Eggs Benedict - it not Christmas with out them!! Your pictures are beautiful. Actually making your macaroon now. Hi Anonymous, Eggs Benedict are great for special occasions, and make an ordinary occasion special! Hope you enjoy coconut kiss macaroons! Thanks for the kind words, and the comment. A favorite "go to" meal for The Chef and I? Poached eggs over cheddar grits w/ some crumbled bacon on top ... I so, so, so love it! Great tutorial on poaching ... I think so many people are afraid of this cooking technique, and they shouldn't be. I'm sure your post will inspire lots of folks to give it a try! 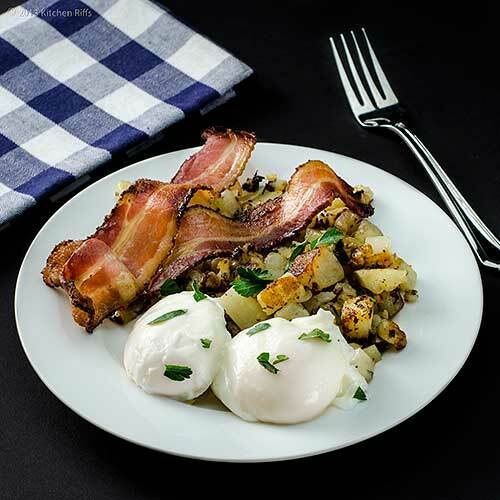 Hi Kimberly, I've never had poached eggs over cheddar grits, but the combo sounds wonderful! The basics are usually pretty easy to learn, but some people do ignore some of them. Too bad, because once you know them, it opens up a whole world of recipes that one might otherwise ignore. Thanks for the comment. Hi Carolyn, poached eggs and asparagus are a wonderful combo! Sounds like you're going to have a delightful meal. ;-) Thanks for the comment. Hi Liz, a lot of people don't like runny yolks, so poaching isn't for them. Although of course one could hard poach the eggs - cook them until the yolk is totally solid. But I don't like the texture of the whites when you cook them that long. Anyway, sounds like hubby is in for a treat! Thanks for the comment. I agree, they really aren't that hard! But I had the same thought as most, that they were too difficult to make at home. I tried them the first time a couple weeks ago with my breakfast beer beans and they turned out perfect :) I will make them much more often now :) Great post! Hi Lilly Sue, not only are homemade poached eggs pretty easy to make, it's also fun! Or at least I always enjoy making them. Thanks for the comment. Well, I'm quite impressed! Your poached eggs are perfect and truly wish I had the patience to even try poaching such a gorgeous egg. I guess I should be embarrassed when I say this, but I cheat and use the little cups and have been using them for years. It's easy and I get the perfect poached eggs every time. They certainly aren't as pretty as yours. I guess one of these days, I just need to give it a try. Afterall, now I have some great instructions. My favorite brunch dish would have to be eggs benedict. I love the creamy, runny yolk of poached eggs, but I rarely make them at home. I really should tho. Yours look just perfect. Great post! Hi MJ, those poaching cups do a great job, but are too fiddly for me. My poached poached eggs aren't perfect but they look pretty good and my method is pretty easy - a double win in my book! Thanks for the comment. Hi Gomo, Eggs Benedict are so good, aren't they? But anything with Hollandaise sauce is good! Thanks for the comment. Love poached eggs, amazing photo! Hi John, :-) Poaching eggs ahead of time is a huge time saver! And if you're afraid you might screw up, you're covered - plenty of time to do some more (although it's rare one screws up once one's mastered one's fear). Thanks for the kind words, and the comment. Hi Raymund, this was a fun post to both write and photograph! Poached eggs are wonderful. Thanks for the comment. Hi Matgalen, aren't poached eggs so good? Thanks for your kind words, and comment. Thank you! I love poached eggs, but never approached this process myself. I am one of those people thinking it's complicated. Will try it tonight; can hardly wait to finish work and go home. Hi La Torontoise, poaching eggs really is simple. Unless your eggs are really fresh, you do sometimes have problems with less-than-perfect whites. But if they bother you, just trim them with scissors. Have fun! Thanks for the comment. Poached eggs have to be one of the most feared foods by cooks. I have done it a few times and really love the taste of them. Thanks for sharing your great tips as I really need to perfect the technique and make them more often. Those are stunning John! I rarely make poached eggs because I don't care for the texture but when I do, I am coming back to this post. Hi Nancy, I don't make poached eggs often enough, either. This is one of those techniques that if you practice, it becomes quite easy. Thanks for the comment. Hi Alyssa, you might try them in salads - when you break them, their yolk becomes part of the dressing. And I thin their texture contrasts well with greens, so you might find it a bit more appealing. Thanks for the kind words, and comment. I do poach eggs fairly often, they're my favorite!! I love them over toast with some hot sauce, nothing better. Great post, John. Hi Kristy, aren't poached eggs so good? I'm not surprised you poach them often - you're a world class foodie! ;-) Hot sauce is great with these. Thanks for the comment. Wow, these pictures are so beautiful you can nearly taste the poached eggs only by watching them! Happy Easter to you and Mrs.K R! John, your poached eggs are PERFECT! And yes, I love the running yolk...and your photos are amazing. Hi Daniela, poached eggs are good, Eggs Benedict better! Thanks for your kind words, and comment. And Happy Easter! Hi Juliana, you're too kind! But thanks for those words, and the comment. And the runny yolk is pretty darn good, isn't it? Hi Sally, just tell your husband that poached eggs are essentially eggs over easy (or sunny side up, basted) with a more gently cooked white. And no added fat. When you think about it, they actually are quite similar. ;-) And if he won't buy that, when you make Eggs Benedict you can poach yours and fry his! Thanks for the comment. 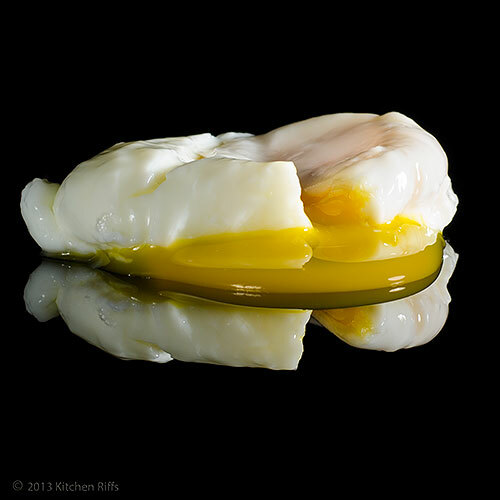 The very first photo in your post of a poached egg against black background is so gorgeous! I always wonder how you capture photos like that - with all black in the background. And, yes, I pouch eggs quite a lot - I have an egg poacher from Williams-Sonoma that I love! Hi Julia, that photo is taken on black acrylic, and it's pretty easy once you figure out your lighting. The main thing is to flag the light so it shines only on the subject, and make sure no light shines on the background - so it'll be black. Thanks for the kind words, and the comment. Hi Barb, Eggs Benedict and chocolate eggs sounds like a wonderful weekend! That photo is taken on black acrylic, although you can use a mirror too. Thanks for the kind words, and the comment. My husband loves poached eggs and it is so nice to see a great write up. Sometimes the simple things are the hardest to get right! And as for peeling hard boiled eggs, well there are a lot of hard boiled eggs that go into a seder; between the chopped liver and the eggs to start. So yes, I am ready to give something else a try. Hi Abbe, after peeling all of those hard-boiled eggs I'll bet you're ready for something else! Thanks for the comment. Why do I not make these more? I mean just look at how gorgeous they are. That top photo is beautiful. I will not be happy until I have a poached egg today. Hi Rosa, you need to make these again! ;-) Thanks for the kind words, and comment. Hi Karen, they're really good, aren't they? You definitely need to do one today! Thanks for the kind words, and comment. John, those looks just perfect - tons of great info too - thanks! Hi Donalyn, this was such a fun post to write! I love poached eggs. ;-) Thanks for the kind words, and comment. Hi Marta, the looks of my poached eggs can vary a bit too - I always blame eggs being too old when they don't turn out quite the way I expect. It can't be me, can it? :D Thanks for the comment. It's nice be back to the blogosphere but it's even better to see this classic poached egg recipe. I first learned how to peach egg when I was taking a amateur cooking class and I have been poaching my egg regularly ever since. Your detailed instruction is right on the money and is exactly how I cook it. Thanks for sharing this timeless recipe! Hi Yi, aren't poached eggs so tasty? And really easy to do once you learn how (and practice a bit). Thanks for the comment. My gosh your poached eggs look PERFECT John! And this is a very well written post. I do enjoy poached eggs but I learned that it's not as popular than I thought after I started blogging and see posts and comments from other people. Hope your post will encourage many people to make poached eggs! Hi Nami, I think people like eating poached eggs - it's the poaching part that seems scary. It's really not! A little practice goes a long way with this technique. Thanks for the kind words, and comment. Hi Kiran, it does take some practice! And if your egg whites look a little ragged - and it bothers you - a bit of a trim with scissors helps too. ;-) Thanks for the comment. Poached eggs always make me hungry. What a great post on poached eggs! Now this is something really really delicious. I loved reading about the method and the picture is so good….it makes me drool! Hi Purabi, aren't poached eggs so good?! One of my favorites. Thanks for your kind words, and comment. Poached eggs are my favorite, John! Your photos are making me very hungry (the first one is just stunning). When I was growing up my mom had an electric egg poacher, which was convenient but I recall a huge pain to clean. I much prefer them made free-form like yours. Thanks for your tip on making them ahead, too - perfect for getting ready for a brunch. Happy spring to you! Hi Hannah, I do remember those electric egg poachers, but never used one. It's much easier just to boil some water and plop the egg in. Making poached eggs ahead of time is such a convenience! Thanks for the comment. Thanks for all the tips and notes, appreciate your effort very much. Hi Ameila, I'll be happy to make two for you! Thanks for the kind words, and comment. Hi Charlie, you really do need chickens. I need chickens too! Actually Mrs K R for years has pushed the cause that we need "two inoffensive little hens." We actually live in a place now where we can keep chickens (in theory - one needs a permit, and they're not that easy to come by), so that may happen someday. Happy Easter to you, and thanks for the comment. Hi Ala, glad to help out! ;-) These are easy once you just starting poaching - it's one of those things where you do it a couple of times, and it becomes pretty easy. Thanks for the comment.